Leeds United and the city council have agreed to enter into negotiations over plans to build a new club training ground in the city. The Championship side, which currently trains at Thorp Arch, near Wetherby, wants to move training facilities to council-owned land closer to its Elland Road ground. Talks will also include the creation of a new community sports village nearby. If approved, both facilities could be up and running by 2020. Leeds United's managing director, Angus Kinnear, said the move would help with player development. He said many talented youngsters in the inner city currently struggled to make the journey to Thorp Arch on a regular basis because of the costs and time it took. The creation of a sports village close to Elland Road would put the club at the heart of the community and act as a catalyst for further regeneration of the area, he added. Leeds City Council, whose executive board earlier agreed to the talks, said the plans could help promote the city and boost investment. Councillor Richard Lewis, executive member for regeneration, said: "We know from when the club was previously in the Premier League the impact that a successful and thriving club can have." He said equally important was the development of a sports village to engage with and inspire the grassroots community. "That's what's been missing for far too long," he said. If given the go-ahead, the training ground would be built on council-owned land on the former Matthew Murray High School site. 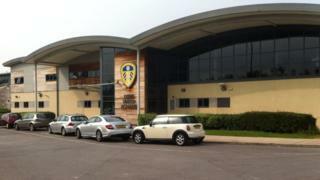 The sports village is planned for Elland Road's Fullerton Park site.